Adventure Foot welcomes guest bloggers any time! If you’ve got a story you want to share about being active, I want to help you share it. You’ll have to message me on Facebook (I’d put my email here, but I can’t take all the spam) and I’ll be glad to include your post. If you guest blog regularly, I want to include a picture and short bio of you… like the one below! Jared Busen is an ultra runner. Highlights include 1st overall and course record in the Farmdale 50 mile trail in October 2010. 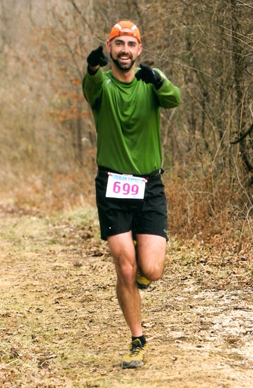 1st overall and course record in the 150 mile McNaughton Trail run in May 2010. Multiple age group placements at various ultra distances. Jared started seriously running while attending Basic Training in 2006 and took to it like it was what he was meant to do. He couldn’t wait to get done with Basic so that he could run on his own, most importantly run further. He did a few marathons but it never sat right, he wanted to go further. His first ultra was a 50k used as a training run for a 50 mile in 2008 and never looked back. Even while deployed to Afghanistan in 09-10 Jared continued to run ultras. Completing a 50k on treadmill one morning just for something to do as well as running 50k around the 0.64 mile perimeter of Camp Alamo where he lived most of his deployment. He took his deployment leave to South Korea and ran a 100k, and a few weeks after getting off deployment returned to South Korea did the Seoul Marathon followed by a 100k six days later. Jared also volunteers as a track and cross country coach at his local high school. It’s been a huge reward in his life training, mentoring and motivating young runners. He hopes to inspire the kids to run their best, and knows that they inspire him to run his. Click here to go to Jared's blog! Proceeds go to the Peace Garden in Southwind Park. Thank you, Victoria! I will add this to my events calendar.